I was honored to be asked to write the review for the book, Conscious Living, Conscious Aging, as Ron Pevny is one of the foremost leaders in the movement as to how to age well. A local Durangoan, Pevny has been doing this work for years, and has founded The Center for Conscious Eldering, serving those of us in the last third of our lives who seek passion, purpose, growth and service as we age. The center’s programs incorporate the power of nature in support of personal growth as an elder, with retreats, workshops and pilgrimages. I was excited to read this book, and felt lucky to get an advanced copy for the review. This is an easily readable and logically organized guidebook for aging with awareness and intention: aging consciously. Pevny’s personal journey is interspersed throughout, and we can see his process and passion for helping people find meaning in these later years. The book addresses the preparation needed when we yearn for something more than just drifting into old age, with perspectives, strategies, practices and stories to help us prepare. To move from middle age into elderhood, Pevny suggests three important stages: severance, leaving behind that which will not serve us in the next years; a neutral zone, where we look for the gifts, talents and qualities that will serve us as we move forward; and reincorporation, discovering and embodying new gifts and potentials that expand our ability to find fulfillment. It’s sort of a letting go of one life stage, jumping into the void and then incubating a new beginning. Exciting stuff if we want to live to our fullest. Part of the severance stage can be doing some concrete things such as a life review, a legacy letter and some forgiveness and grief work, a “healing the past.” This work gives us meaning from the stories of our lives and can open our hearts as we let old stories go and “re-contextualize” (reframing the way we understand our painful life experiences) others. There are detailed directions for all of this work that seem more healing than laborious. When we’ve done some work letting go of who we were in middle age, we may want to build into our lives times of quiet and solitude (especially in nature), look at nighttime dreams, pay attention to odd synchronicities and engage in some form of creative expression. This is a time of being aware on a deeper level, and those small voices from within can be powerful tools for our opening into our true elder selves. The reincorporation phase brings us to finding people and opportunities to align with us as we work, step by step, to bring our gifts to the world. This is the new growth we can find as we age. It may show itself as a specific passion for work in the community, or out in the world somewhere. Or, it may be quietly creating some form of art, or a deepening of spirituality, or all of these. We find expressions of our deepest being that will lead us to an end of life with no regrets, no unfinished business, no loose ends. The book offers practices for staying conscious, a great look at the confidence and joy vs. fear and negativity story in all of us, a suggestion to create “Ten Intentions for Ten Years,” tips to keep a broad vision of these years, and how to find support in our community. Believe me, there are many of us on this path – there is strength in numbers! Ron ends the book with specific exercises and the processes to do them, a great recommended reading list for those who want to do more and a list of organizations that support aging consciously. This is a treasure trove. I love the personal stories from retreat and workshop participants at the end of each chapter, illustrating so well the points therein. I also appreciate how open and vulnerable Ron makes himself, as he shares his very personal points along the way to where he is now. Extremely heartfelt. As I read through Pevny’s book, my only dilemma was how to organize all the notes I took as to “for the book review” and “for my own work.” This book speaks to me, loudly, as it sorts out all my chaotic thoughts into a very doable and fulfilling process I want in order for my later years to be the best they can be. 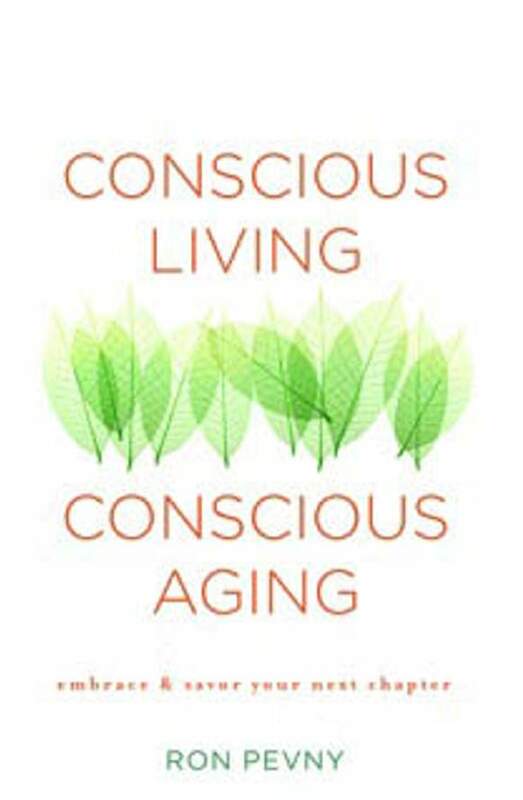 The release date for Conscious Living, Conscious Aging was Tuesday, and Pevny will be speaking and signing copies at Maria’s Bookshop at 6:30 p.m. Oct. 30. See you there!